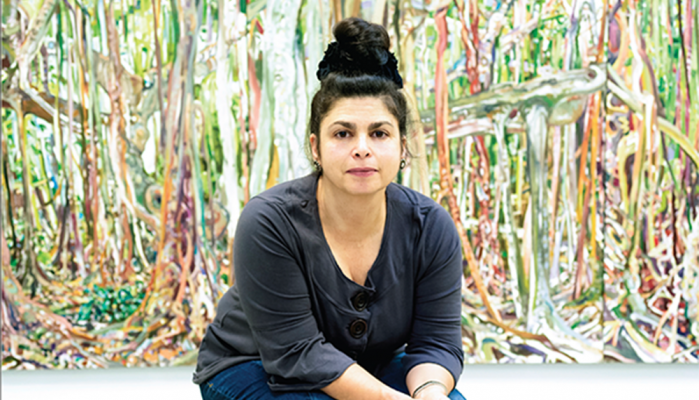 Art Professor Lilian Garcia-Roig’s large-scale, on-site painting installations overwhelm the viewer’s senses. Each individual part was painted by the artist outdoors in front of the scene, a technique often called en plein air, over the course of a day. Garcia-Roig, who was a resident artist at the Skowhegan School of Painting and Sculpture in 1990, returns to Maine for Relational Undercurrents: Contemporary Art of the Caribbean Archipelago and for this special conversation with PMA Associate Curator of Contemporary Art Jaime DeSimone on March 27th, at 4pm. The Portland Museum of Art is located at Seven Congress Square in Portland, Maine 04101.